Press enter to see results or esc to cancel. I started reading the adventures of Spider-man in issue #176, back in 1978. I’d fallen way behind on my comic reading lately. Over the past few days I finally caught up with Amazing Spider-man through issue 800. What a jumbled mess. A lot of the run was completely incoherent because it crossed over with other books between issues. I had no idea what was going on. Characters appeared and then were gone. Endless retreads of goblins, clones, Venom varients, and characters coming back from the dead. I loved the Superior Spider-man run. After that, it seems like everything went sideways. I didn’t enjoy it at all. When Otto took over as Spider-man, I thought it was a very cool twist on an old charcter. Dan Slott told it well. I knew things would not remain that way. I was hoping to see Peter take some of the things Otto had done when he returned as Spider-man and make positives out of them. Otto’s inevitable return should have made him a much more complex and interesting character. What I saw of him just kind of put him back where he was. I have not read the Clone Conspiracy books yet. There may be something I’ve missed. Amazing Spider-man carries what I think is one of the larger problems Marvel has with storytelling. Forced crossovers. It would direct me to go to an issue Clone Conspiracy as I was reading. Then another book along the way. I read the next sequential issue instead. I had no idea what was going on. I can’t stand that the first page of every book has to be a “the story so far” with a damn flow chart of connected characters. I believe you have failed as a story teller if you need to give readers a flow chart. I want to be able to read a book in sequential order and be able to get an entire story from one issue to the next. Spider-man failed at that. It is a complete and utter dud when read by itself. I don’t blame Slott’s writing for this. The problem is more likely the editorial team, wanting to sell more Spider-man books. I was digging the art when Humberto Ramos was drawing Spider-man. 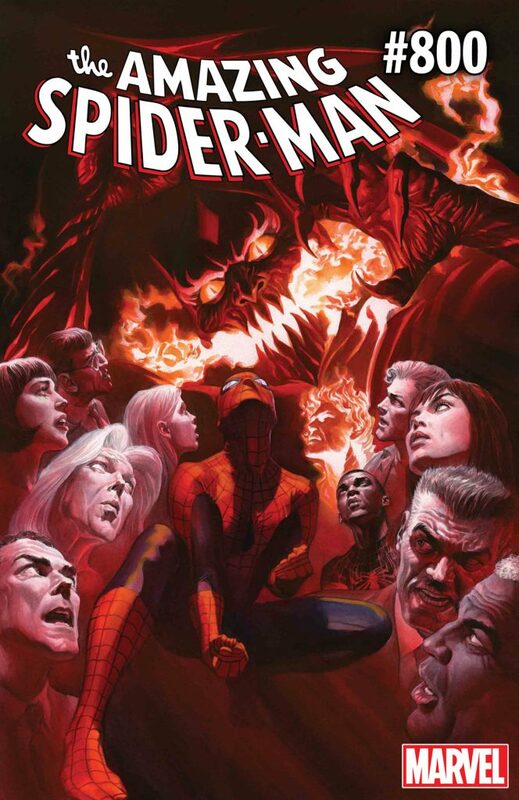 For Marvel’s top book, I was not impressed with much that I saw after he left Spider-man. I don’t like to slag my fellow artists. There were some great pages and panels in there. The art is not something I would continue to buy this book for. The cover art by Alex Ross was very cool. I’d love to see Spider-man find a new long-term art team that really fits the character well. Superior Spider-man was my top book back in the day. The current run has fallen flat for me. I am a web designer, comic book writer, artist & publisher, and bassist. I play World of Warcraft & Hearthstone for fun.